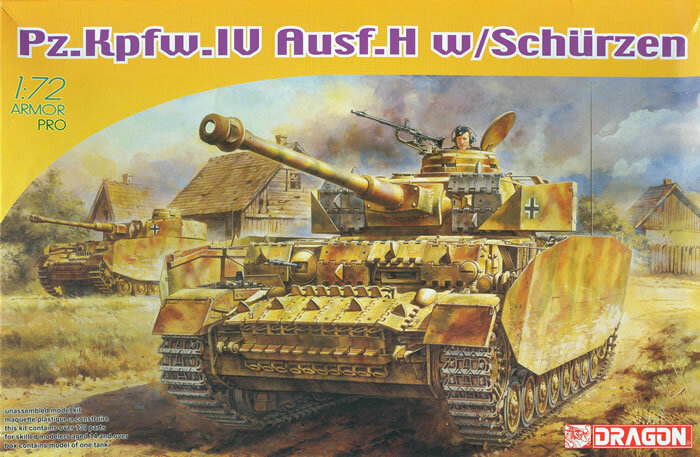 Two years since their last 1/72 Panzer IV DML has now released a nice new kit of the Ausf. H with a complete set of schuerzen shields. While there is no etched brass provided, DML has used a variation on their “thin shield” molding so that the shields look very close to scale while being thick enough to use. This kit is new but uses parts from their Brummbaer and self-propelled 8.8 cm on Panzer IV chassis kits as well. The rest of the kit mirrors the construction of the larger 1/35 scale “Smart Kits” but with some assemblies either simplified or combined, as that makes better sense in this scale (in 1/35 some of the Pzkw. IV variants have upwards of 800-900 parts). Each bogie assembly here consist of five parts: carrier, road wheel pairs, and road wheel centers. Oddly the centers also appear to carry part of the tires, so other than molding fidelity it does not seem to offer any assistance for painting. Detail, however, is outstanding in this (or even some larger) scale. The turret is pretty detailed in this scale but uses a simplified gun assembly consisting of only 8 parts; the barrel is slide molded with a hollow muzzle brake in one piece and inserts directly into recoil housing; note that even the machine gun barrels are slide molded (as is the exhaust pipe on the muffler) so the modeler does not have to open them up. The commander’s cupola consists of only two parts and has the hatches sealed; ditto the side hatches. Unlike other recent DML 1/72 kits no information is provided for the kit’s track length or if they need to be stretched or clipped to fit. Five different finishing options are provided along with a targeted sheet of Cartograf decals: Unidentified Unit, Eastern Front 1943 (tricolor, black crosses); Unidentified Unit, Vistula River, Poland 1944 (tricolor, black 923); 3rd Panzer Division, Ukraine 1943 (green spray over sand, crosses, red 624); 2nd Panzer Division, Normandy 1944 (tricolor, white 802); 2nd Panzer Division, Normandy 1944 (tricolor, white 823). Overall this is a good kit but some modelers may be disappointed at the lack of etched brass and the fixed hatches.